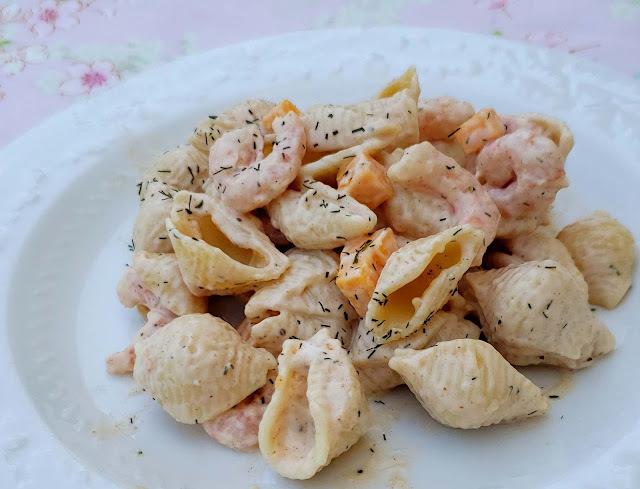 Creamy seashell pasta, cubes of cheddar cheese, and tender young shrimp sprinkled with dill come together for one of my favorite cold pasta salads. Our local credit union meeting has a catered luncheon every year, and this seafood salad was always the star of the meal. I looked forward to it every year. This year, this amazing salad was missing. Instead, a green salad and potato chips took its place along with the cold cut sandwiches. Whaaaaat?? I was heartbroken. What happened to tradition? What am I going to look forward to? This was the sign that it was time to make my own shrimp pasta salad. It was super easy to make, especially using our pressure cooker and our family loved it. Why use a pressure cooker to cook pasta? Now, we can have this fantastic, fresh seafood pasta salad any time we want. 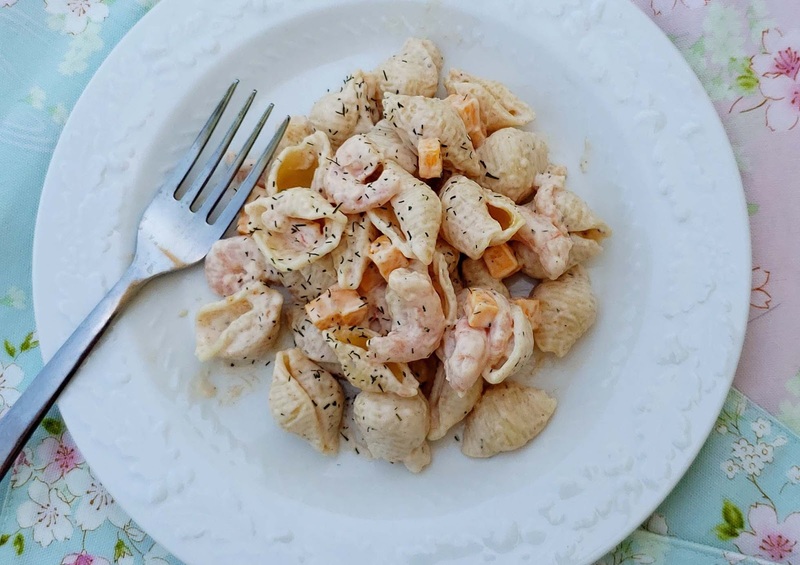 This is an extra special pasta salad that has tender young shrimp. Small salad shrimp can be found at the deli or seafood section of your grocery store or in the freezer labeled as 100 per pound. You can substitute fresh or imitation crab or use a combination of shrimp & crab for a seafood pasta salad. Optional add-ins in the recipe keep it fresh and interesting. 1. Put pasta into pressure cooker pot and pour in water.2. Add 1/4 teaspoon salt and stir.3. Cover the pressure cooker, close the pressure valve, select HIGH pressure and 5 minutes for al dente or 6 minutes for a softer cooked pasta.4. When cook time has finished, use a controlled quick release by opening the pressure valve in short spurts, until you can open it all the way.5. Drain and rinse pasta under cold water and put into a medium bowl.6. For dressing, whisk together the mayonnaise, mustard, cocktail sauce, Worcestershire sauce, salt, Old Bay, lemon juice and dill.7. Gently stir dressing into pasta. 8. Fold in salad shrimp, cheese or other optional ingredients. 9. Cover bowl tightly with plastic wrap and chill in the fridge for 2-3 hours. 10. Before serving, stir salad and add any milk for a creamier consistency, if desired. Salt to taste. Fill a medium saucepan with 4 cups of water and bring to a boil over high heat. Add salt and pasta, stirring well. Reduce stove to med-high heat and cook pasta for 10-12 minutes or till tender. Drain and rinse with cold water. Make dressing as listed above, stir into cooked pasta and chill in the fridge for 2-3 hours. Serve and enjoy!